So you’re thinking about getting engaged, and now you’re ready to buy the ring. Yet, you have no idea where to begin or how to decide. For many, the focus is on the center diamond, however, the band you choose also makes a huge impact on the appearance and cost of your ring. The choices can seem overwhelming, but you can relax; Brilliance has your back. We think that engagement ring shopping should be a positive and exciting experience. Like the images from fairytales, this monumental moment should be everything that you imagined! This is a once in a lifetime event, and even the buying process should be an exhilarating milestone. There are many tips to buying a ring, but one of the most important, next to know your budget, is to know the ring size! Ask friends, relatives, borrow a ring from your partner’s collection, but uncover the secret of size. There’s nothing worse than “putting the ring on it” only to have it slide right off, or not be able to get it on at all. If a diamond are is a must-have, then the choice of shape comes into play. For a safe choice, the round cut diamond is the most popular. However, princess, cushion and oval shapes are also stunning choices and are universally flattering. Step-facet cut stones, like asscher and emerald shapes, are the go-to diamond shape for an old-world vintage look. For a more modern shape, curvy marquise and the teardrop-shaped pear appeal to those who want a standout stone. Check out our Ultimate Diamond Buying Guide for the scoop on all things diamond. When it comes to choosing the band, it’s easier when you know if your future fiancé prefers cool-hued metals or warmer gold. Cool-hued metals (also known as “white metals”) include platinum, palladium, white gold and silver. Platinum costs twice as much as gold, but it is extremely durable. While Palladium is very budget-friendly and hypoallergenic. Rose and yellow gold settings make for a bold and beautiful choice. Not to mention, both warmer options can help mask the yellowish hue of a lower color grade diamond; saving you hundreds of dollars. There are many more tips to ease you through the buying process, and knowledge goes a long way in uncovering the perfect ring! 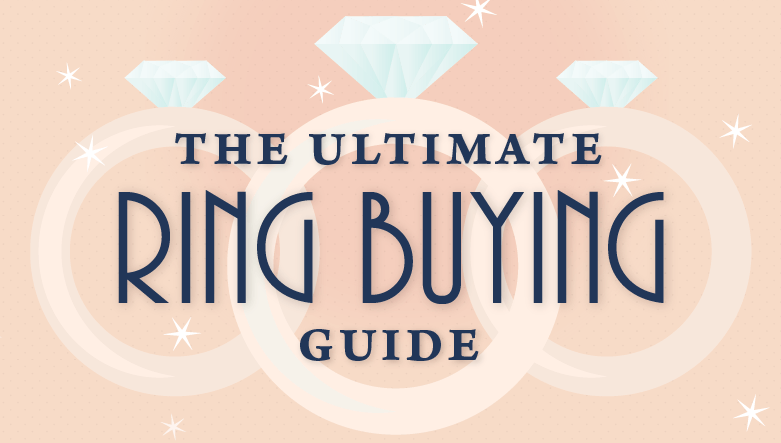 When you’re ready to get schooled on karat vs. carat, band widths and all the settings available for rings, check out the infographic for a picture-perfect look at the Ultimate Ring Buying Guide!